I’m truly blessed these days. I unexpectedly received another award this morning from Marantha Jenelle. It’s one that she made up so that she could pass them out to her friends. Thanks very much, Marantha. Here’s what it looks like. Cool, eh? This entry was posted in General, Marketing and Promotion and tagged blogger, blogger award, blogging, postaweek2011. Bookmark the permalink. by the way, how did you get images of my two main characters for “the ihmaeeran chronicles”! that is mayna and shaeela to a “t”! oh, did you get a chance to read what i sent you? if so, what is your opinion? I got the Chronicles but didn’t notice if the two images were attached. Thanks for sending it. However, I don’t think I’ll be able to get to it for a while. I’m still in the midst of trying to get my website up and running. And I have two deadlines to meet for two various things, plus I do bookkeeping work at home for clients, plus I try to read and answer some posts, plus…I’d better stop. I’m getting tired just listing them all. Don’t worry though. I will eventually get to your book. I am looking forward to reading it. Yay! 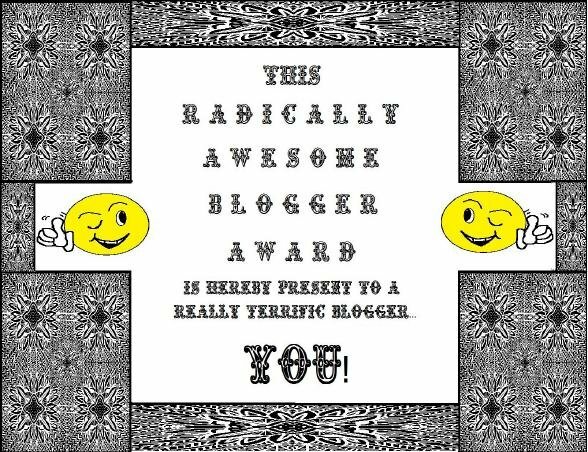 You are totally radical and deserve recognition for it! Congrats, Sandra!